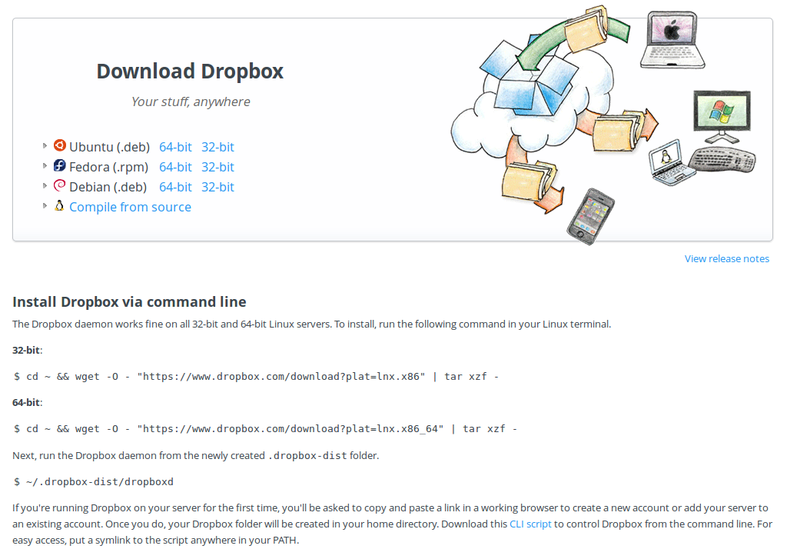 Dropbox was initially installed using the Ubuntu Software Centre. For the inexperienced user, is it best/easier to remove the package from within the USC and then re-install or is there a more elegant way of obtaining the update, for example using sudo apt-get update dropbox ? For the inexperienced user, it is absolutely best and easier, by a long stretch, to not install any packages manually. Installing a .deb package manually means that you will not receive any more automatic updates to that package, since it was not installed via any repositories known to your system. This means you will have to keep updating that package yourself, e.g., regularly going to that Downloads page and downloading the newest version. Additionally, the packages available there have not undergone any quality checks by Ubuntu, and so compatibility with your system is not necessarily guaranteed. Worst case, you may end up with some weird unresolvable dependencies. So yes, there is a more elegant way of obtaining the update: sit back and wait. The newest version of the Dropbox client will certainly be added to the Ubuntu repositories soon enough. If the Dropbox client available in the repositories did not work any longer with the current Dropbox servers, this would be a problem that would not affect only you, but thousands of other Ubuntu users as well. And so, it would be resolved quickly. To sum up, don't try to fix a working system. The name of the package may be slightly confusing. It is the one package in the official repositories that contains the actual, proprietary Dropbox client itself. That is, when you install this package, it will automatically download the proprietary Dropbox client from the Dropbox website and install it (to /usr/bin/dropbox). Yes, it does also contain an extension to integrate the Dropbox client with Nautilus, Ubuntu's standard file manager (/usr/lib/nautilus/extensions-3.0/libnautilus-dropbox.so), whence the package's name. Since the package contains non-free, proprietary software, it is contained in the multiverse repository. For all the reasons I mentioned under "Some general advice", this is the one method I absolutely recommend to install the Dropbox client, particularly so for Ubuntu novices. It will be managed by the package manager, it's in the official repos, you'll be fine. The Ubuntu Team will take care of that package working for you. Dropbox manages its own repository that you can add to your list of package repositories, and install the Dropbox client from. See How do I add or remove Dropbox from my Linux repository? on the Dropbox's website help pages. Once you've added that repository as explained in the instructions under that link, you will be able to install the proprietary Dropbox client directly from the Dropbox servers using the package management system. sudo add-apt-repository "deb http://linux.dropbox.com/ubuntu $(lsb_release -sc) main"
This is the second best method. The package is still managed by the package management system, but the repository is not managed by Canonical. So while you'll receive updates via the package management system for that package, you'll just have to trust that the package provided by Dropbox will work fine with your Ubuntu system. A slight advantage may be that this package may be more up-to-date than the nautilus-dropbox package in the multiverse repository. So if you like to be on the bleeding edge this option may be more interesting for you. However, as I said the first option will certainly work, i.e., if the Dropbox client provided in the multiverse repo does not even function anymore, this problem will certainly be taken care of. (Again, slightly more elegant than what they tell you - this will work for both 32bit and 64bit). What this does is create a copy of the Dropbox client in your home folder. This installation is local (it can only be used by the user who executed that command), not system-wide. Additionally, updates will not be managed the package management system. According to a comment by DKBose to this answer, when installing the client like this it will still be automatically updated. If that holds true, it only means that the client itself checks for, downloads and installs its own updates. Since it is installed locally inside a user's home folder, it doesn't need root privileges to do so. However, the client is not managed by the package management system. It is very un-Linux like to rely on such proprietary, intransparent update procedures - this is usually the job of the package manager, which does this centrally and transparently, so that you can use it to list, update or remove any of your installed packages. This is for the version I just tested, and works as of now because what the downloaded archive contains is precisely this .dropbox-dist/ folder. It may change in the future. When you don't use the package manager you cannot really track what files were installed where. I would use this method if and only if I have no root privileges on a machine, and therefore am forced to a local install. If you do have root privileges, even if you insist on using the version that comes directly from the Dropbox servers, the second method is still to be preferred. At least the package management system will track the installed files, updates happen in a more transparent fashion and removal of the software is smooth. Summing up, my advice is this. If you installed the Dropbox client using methods 2 or 3, uninstall it, and install it using method 1. Whatever you do, with the first two methods the Dropbox client will be automatically updated by the package management system. When using the third method, the client apparently also takes care of updating itself. So basically, there's no need to worry - you will automatically get the newest version anyway. I would uninstall your current version through the Ubuntu Software Center. Then go to the link and download the .deb for your architecture (32 or 64 bit), and install that. That will add the repository to your system and updates will be install with regular system updates, when they are available. I would download and install the deb, after uninstalling the old one. As the email says, there are important security improvements. Security updates are of the utmost importance and should be installed. If you wait for the repos to be updated, then you may be waiting a while. I found that when I installed from the drobpox package repository (which at this moment provides the same deb as the one from the download link), I was unable to use dropbox - after entering my account details, the dropbox window reported in red that I needed to install an updated version from the web page indicated in the question. When I downloaded and unpacked the tar.gz file and installed as per instructed, dropbox is working once again. Note that with this version, you have to run it manually (or set up something to run it automatically). Also, to connect to your dropbox account, dropboxd writes a url to the terminal where you ran it. If you paste that url into a browser and enter you account login details, dropbox starts syncing your files. I had to do one more thing: I have my local dropbox folder symlinked to another hard drive. dropboxd didn't recognise the symlink, created an empty directory in it's place and started downloading all my files (there are many!). I killed dropboxd, recreated the symlink and restarted dropboxd again and all's fine (well, it had to re-index everything, which took a while). Not the answer you're looking for? Browse other questions tagged software-installation dropbox or ask your own question. installing Ubuntu within Windows 7 — where do I get the Wubi file? Where can I download the latest version of Dropbox?